Saints InterchangeDarren Minchington off due to an injury. Hawks InterchangeBrent Guerra off due to an injury. The Saints look good in the early stages, they have been doing plenty of attacking but they need to convert when they get an opportunity especially against a team like the Hawks. GOAL HAWKSRioli with the handball over the top to Grimely, he side steps & unloads from 40 just inside the boundary & splits the middle! An opportunity for Riewoldt as he has a hurried snap, however his kick misses everything as it goes out on the full. GOAL SAINTSRiewoldt with the chip kick inside 50 finds Saunders, he lines up 38 out directly in front & he threads it through! GOAL HAWKSBreust with the inside 50 & plants the ball on the chest of Roughead, he lines up 45 out on a 45 degree angle & the Hawks are on the board! BEHIND SAINTSRiewoldt lines up 48 out on a tight angle, he unloads but his kick also falls short & comes off the pack for a minor score. BEHIND SAINTSSaunders receives the handball in the forward pocket, he has a hurried snap but his kick falls short & it's punched through for a rushed behind by Lake. The siren sounds, the umpire goes bang & we're underwaythe Saints get first use of the ball out of the middle & clear. Welcome to Etihad Stadium for the clash between St Kilda & Hawthorn. Hawthorn are without Franklin but will have plenty of firing power up forward to get back on the winners list. Welcome to Etihad Stadium for the St Kilda v Hawthorn Round 20 clash. 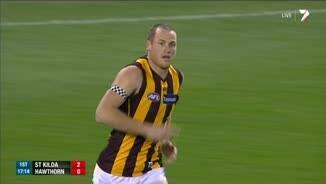 JARRYD Roughead steered Hawthorn to its 16th victory of the season, booting five goals as the Hawks cruised to a 46-point win over St Kilda on Friday night at Etihad Stadium. In a game that went exactly how most expected, the Hawks won every quarter and ran away with a 14.18 (102) to 7.14 (56) victory. The Saints showed some resistance early but were ultimately overwhelmed by a Hawthorn outfit with too much skill, speed and firepower. It was the sort of encounter that strengthened calls for the home and away season to be shortened. Predictable and flat, the match is unlikely to be highly coveted at any Name A Game DVD sales. The Hawks were far from their devastating best, but it was an important bounce-back victory after last week’s disappointing loss to Richmond. St Kilda now appears certain to finish third-last on the ladder with three rounds to play. With captain Luke Hodge and spearhead Lance Franklin watching from the sidelines, the game offered an opportunity for other Hawks to place themselves in finals contention. It also gave coach Alastair Clarkson a chance to try a few things. Cyril Rioli started in the middle, athletic tall Sam Grimley showed his run and dash, Matt Spangher contested, and Jonathan Simpkin was courageous in the air and neat with the ball. Shane Savage and Taylor Duryea took the chance to impress. Savage had 30 clean disposals, while Duryea gathered 21 – the most of his fledgling career – and made good decisions off half-back. The pair was among a host of usual suspects to play well for the Hawks, headed by Shaun Burgoyne (29 disposals) and Sam Mitchell (24). Roughead's five-goal haul left him equal with West Coast’s Josh Kennedy atop the race for the Coleman Medal with 59 goals. 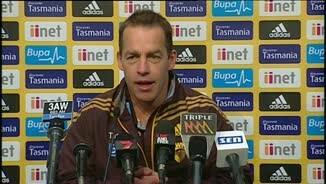 Jack Gunston was subbed out of the game in the third quarter and had ice on his thigh, but Clarkson said he was fine. "They showed us how to go about it in the first quarter, but fortunately for our guys we got it together after that and ended up winning the clearances quite convincingly, and also the inside 50s," Clarkson said post-match. "There's no doubt if you win that area of the game it's going to help you win the game of footy, but you're not going to have it on your terms all the time. St Kilda had us early, but we managed to pull it back later in the game." Saints coach Scott Watters said the damage had been done in the second term. "There were some elements out of the three quarters we were really happy with, we won the contested ball tonight which was a target we set ourselves for," Watters said after the loss. "But our ability to sustain over four quarters is still a challenge for us right at this point. "But three quarters against a potential premiership side … there's a lot to take out of that for us." Jack Steven (33 disposals) was busy for the Saints through the midfield and continued his consistent season, and veteran Leigh Montagna had 35 possessions. Captain Nick Riewoldt held nine marks and offered plenty of leads in a typically hard-working display. With a plan to play on at every opportunity, the Saints started well, and looked to unsettle the Hawks in the early moments. Steven won the ball at the stoppages and also burst away from them, and he wasn’t alone – the Saints had 39 contested possessions in the first term to Hawthorn's 18. The stat isn't always seen as a measurement of effort, but in the first quarter it certainly told a story: one of a side with finals on its mind, and another keen to end a disappointing season well. Stand-in captain Jordan Lewis gave his side a stern address at the first break, and it seemed to have an influence, with the Hawks kicking five goals in the second term to establish a 37-point lead at the main change. 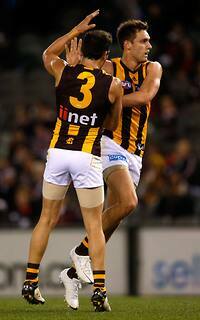 By half time the Hawks had entered their forward 50 on 27 occasions and scored 21 times. Not for the first time this season, the Saints' undermanned defence struggled to keep up. 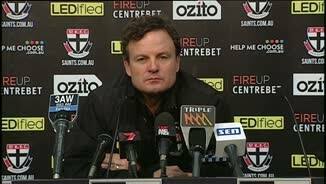 The substitution of backman James Gwilt at half-time didn't help that cause, but the Hawks never really blew St Kilda away. They just did what was required. It was hard not to think they weren't setting themselves for next Friday's meeting with Collingwood, a game likely to provide a far better pre-finals test run. "We saw them (Collingwood) at their best last week against the Bombers – they were super," Clarkson said. "We're going to need to play a little bit better than what we did tonight to match it with the Pies, but we look forward to that challenge. The Hawks coach said Lance Franklin (hamstring), Max Bailey (knee), Luke Hodge (thumb) and Grant Birchall (knee) could return for the MCG clash with the Pies. 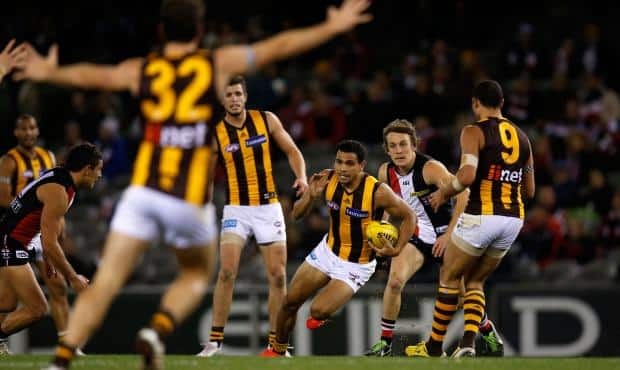 Cyril Rioli bursts through the midfield for the Hawks on Friday night. Picture: AFL Media. St Kilda: Stephen Milne (calf soreness) replaced in selected side by Adam Schneider.